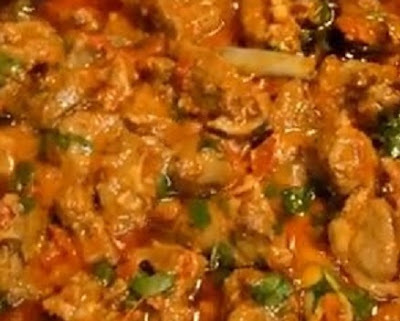 The karahi gosht is an dish of warriors as they say and region of the dish was Afghanistan when it was first added to the feast, and has been one of most favorite dishes of Afghanistan and Peshawar sides of Pakistan. When first Mughal king Babur was defeated by another Persian king and was pushed towards Afghanistan, Babur spent few years in Kabul, on his second term out his (three terms) of Dehli throne Babur brought back some of Afghanistan's dishes to India. Babur himself proud of his family tree because from father side he was Afghan/Turk and his mother had Mongolian blood, as you can see from Mughal dishes they do intend to change by mixing Indian flavor to Persian and Arab dishes but for this dish was not changed for simple reason, Babur himself was a great warrior and he loved Kabul, infect he wanted to rule over India from Kabul but because India was not only a big country but also lots of other Muslim king had their eyes on India. 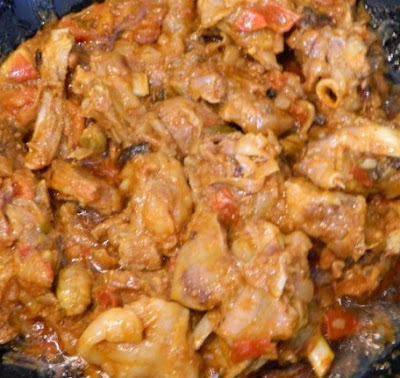 Karahi mean wok or pan in which this dish is cooked and gosht is an Persian for meat and that is the reason this dish is called karahi gosht. It is very simple to cook and main ingredients for this are meat and spices. Although this dish has been well famous all over Indian subcontinent and parts of middle east for long time but Peshawar is still the best place for this dish. I have seen some places in Peshawar where they will cook it with fresh meat while you wait and the taste is extra yummy. If you like it please do use comment box below and do not forget to subscribe our site to get new recipes everyday, we don't just share the recipes from around the world, we dig the history for you to bring some of the best recipes for you and we bring the memories of ancient life into your kitchen. In a large bowl add meat, salt and lemon juice, mix well and set aside for 30 minutes. Heat oil in a large wok / karahi, add onions and cook on medium flame till transparent, add ginger, and turmeric cook till onions are golden brown, add coriander powder, mustard seeds, garam masala, allspice, and chilies, keep stirring till everything is mix well. Add mutton pieces and stir until the spices cover the meat well. add water and cover the wok with a lid and lower the flame to simmer for about 45 minutes til the lamb is cooked. 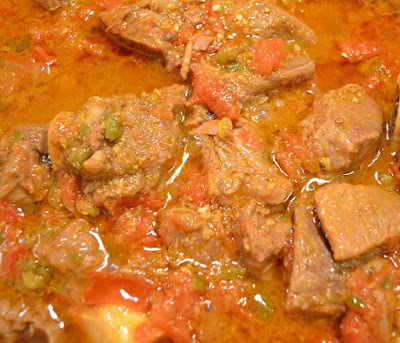 When the meat is cooked, add chopped coriander and tomato, and mix well. serve with chapatis, naans or boiled rice.